So often people assume that Julia Child’s recipes are fancy and complicated, but I have found that many of them are just basic recipes for homemade food. This vinaigrette type salad dressing of Julia Child’s is an example of that. It is a simple homemade salad dressing. It contains just a few ingredients that most have us have in our pantry or cupboard. If you have never made your own salad dressing you should give this recipe a try. 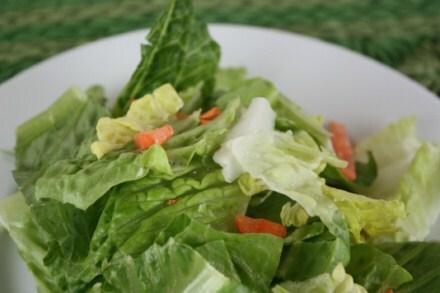 This is a basic recipe and a great place to start with homemade salad dressings. 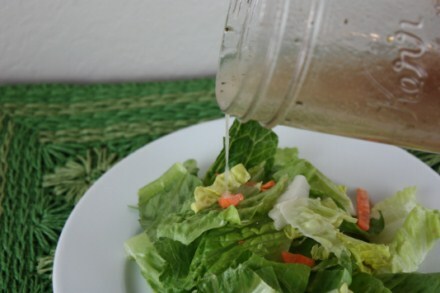 Homemade salad dressings are so easy to make. Not only that they are so much healthier than store bought ones. Once you make your own dressings at home, you may never go back to the store bought versions. Beat ingredients together well. I like to just put this in a jar with a tight lid and shake well. This way I can mix and serve in the same container. One tip on homemade salad dressing is that they do become fairly solid in the refrigerator. This is fine and they will mix back together after a short time at room temperature. This post linked to Frugal Fridays and I’m Lovin’ It. This is a classic. I love mustard vinaigrettes. It will keep in the fridge for a long time so you don’t have to make it all the time. Sounds like a nice, easy salad dressing. I’ve started making the majority of our salad dressings myself, so I’m always on the lookout for new ones to try. Thanks for sharing! I use my immersion blender to blend my salad dressings. The dressing stays blended together longer and seems more like “store bought.” Additionally, if your dressing has sugar in it, blend it very well with the vinegar before you add the oil. This prevents any gritty mouth feel and helps hold the emulsion longer. @karen, Thanks for the tips. I will have to try that next time I make a dressing that calls for sugar. Thanks. Thanks for the great recipe. I am going to try and make it this weekend for Father’s Day. I have always love this vinaigrette. Its a classic French recipe. I sometimes use Maille’s grain mustard as well. Happy Friday, I’m a new follower. Thanks for sharing. @Laura Beth, I usually use mine up pretty quickly. I don’t make a large batch, but I am guessing a few weeks would be fine. @Catherine, You may be right, I guess I just always keep salad dressings in the fridge. I would probably keep it in the fridge to be safe, but you may not have to. Made this this weekend and it was quite good! This was an awesome recipe, I loved it! I am just wondering, if I add fresh bits of garlic to it, will it still keep for weeks in the fridge? Does anyone know for sure? How do you know that a dressing went bad, anyway? Thanks! @Polina, I am so glad that you enjoyed this. Because this has vinegar in it, I am guessing that it would still last a week or two in the refrigerator even with the garlic in it. And that sounds like a great addition to this recipe.